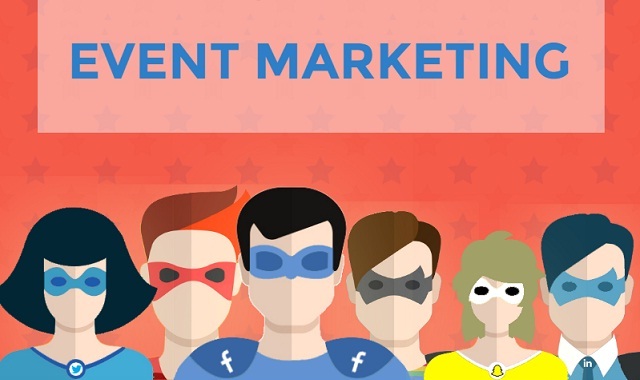 Social Superheroes Present: Event Marketing #infographic ~ Visualistan '+g+"
The events industry is evolving faster than ever before, and it would be fair to say that all event organizers, small businesses and corporations are utilizing the power that each of these social communities hold. For example, did you know that Twitter registers around 310 million active users every single month and 500 million tweets are sent out every single day? Many of these statistics aren’t that surprising to many, but it’s important to be aware of them and to approach new technologies with open arms, as there power can be hugely beneficial to the overall success of our events. Whether you’re creating a Facebook community via the pages feature, compiling a list of influencers on twitter, or liaising with potential speakers for your event on LinkedIn, each platform serves a purpose for us when the marketing and organizing processes are in full force. You’ll also find tons more useful statistics in the visual below, compiled from the most up to date, trusted resources on the web. Before you look, can you guess just how many journalists make up the twitter numbers? Either way, this percentage could potentially be tweeting about your next event! The possibilities are endless.